Fig. 17.1. Potential effects of increases in atmospheric nitrogen deposition on carbon dioxide (CO2) sequestration, nitrous oxide (N2O) emissions (direct and indirect) and methane (CH4) uptake. et al., 1996) have been attributed to fertilization effects caused by enhanced atmospheric CO2 concentrations (e.g. Melillo et al., 1993; Friedlingstein et al., 1995) and nitrogen deposition (Holland et al., 1997; Nadelhoffer et al., 1999), as well as by increased temperatures or by a combination of those effects, increasing the growing season (e.g. Myneni et al., 1997; Hasenauer et al., 1999). (ii) fire suppression; and (iii) expansion of woody species into grasslands and savannahs. 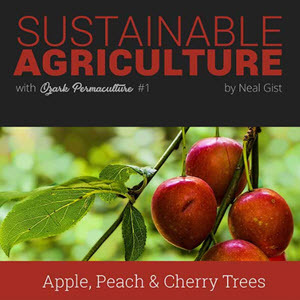 For a more detailed discussion of these controls on past, present and future forest productivity, we refer to Hymus and Valentini (Chapter 2, this volume). The impact of environmental variables (atmospheric CO2 concentrations, nitrogen deposition temperature) on enhancing forest growth has been, and still is, a subject of much debate. Some authors claim that nitrogen deposition is the most important (Rehfuess et al., 1999). Others claim that increases in primary production of plants are largely due to elevated atmospheric CO2 concentrations (CO2 fertilization effect), with related increases in water use efficiency (Osborne et al., 2000). Still others indicate that such a response is rather limited, with any initial increase in the plant-based CO2 sink disappearing within a few years (Tognetti et al., 2000). Temperature effects, including advancing spring bud break and the greening up of forest canopies in mid- and high-latitude forests, lengthen the growing season which is correlated with an increase in net ecosystem production (NEP) (Baldocchi and Wilson, 2001). It is clear that a combination of changes in climate and atmospheric composition has had significant effects on terrestrial productivity over the last few decades (see also Hymus and Valentini, Chapter 2, this volume). The effect of changes in the seasonality and amount of rainfall is not yet given much attention. Regarding impacts of environmental variables on forest growth, it is clear that nitrogen deposition is an important variable, since nitrogen is often the nutrient that is mostly limiting NPP in forest ecosystems. 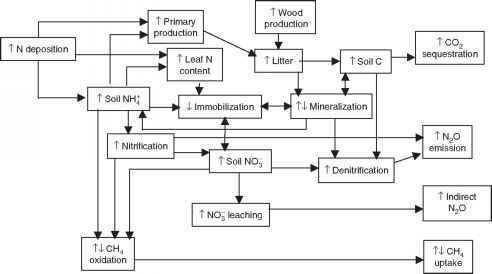 The increase in nitrogen deposition in forests may raise carbon sequestration by augmenting wood production and accumulation of soil organic matter (Fig. 17.1). Current hypotheses suggest that larger nitrogen deposition causes a higher rate of soil organic matter accumulation through: (i) an increased leaf/needle biomass and litter production (e.g. Schulze et al., 2000); and (ii) a reduced decomposition of organic matter, depending on the stage of humus formation (Berg and Matzner, 1997; Harrison et al., 2000; Hagedoorn et al., 2003). Chronic nitrogen additions to temperate forest soils in the USA have been shown to cause an initial increase in soil respiration, but continued additions for more than a decade resulted in a reduction in soil respiration of more than 40% (Bowden et al., 2004). The nitrogen content of forest litter and humus might thus be an important indicator of the soil carbon sequestration. However, the true potential for elevated nitrogen deposition to increase carbon accumulation in both below- and aboveground sinks appears to be much more limited than earlier thought (e.g. Holland et al., 1997). A detailed 15-year-long nitrogen amendment study in Harvard Forest, USA, showed that the large increases in carbon accumulation that were predicted, using a linear relationship between leaf nitrogen content and photosynthesis, failed to materialize in the field (Bauer et al., 2004). Understanding the nitrogen cycle in semi-natural ecosystems is therefore the key to understanding the long-term source or sink strength of soils for carbon. Insight into the soil carbon sequestration is crucial since the soil is the ultimate sink or source of CO2 for forest ecosystems in the long term. By far the largest amount of carbon stored in forests in the northern hemisphere is stored in the soil. More information on the soil CO2 sink is given by Smith and Ineson (Chapter 4, this volume).